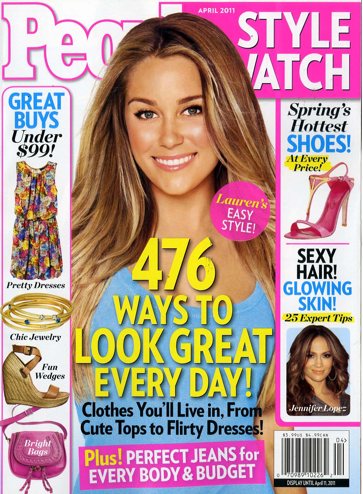 There is no question about it: People Style Watch has been a success story for this brand extension of People magazine. And, as is in any success stories imitators will take notice. I have always written about the three types of new magazine launches: The Ground Breakers, the ones that there is nothing like them on the marketplace when they first arrive; the Copy Cats, the ones that are quick to jump into the marketplace riding the coattails of the Ground Breakers and in some cases learn from the mistakes of the Ground Breakers and do a better job; and the Cheap Imitators, the ones that devote themselves to produce cheap copies of what they deem a success story on the newsstands. Well, that brings us to Today’s Black Woman Style Report magazine that just published its second issue. Take a look at it and compare it with the latest issue of People Style Watch. Is it too close for comfort, or is it just me? What say you? 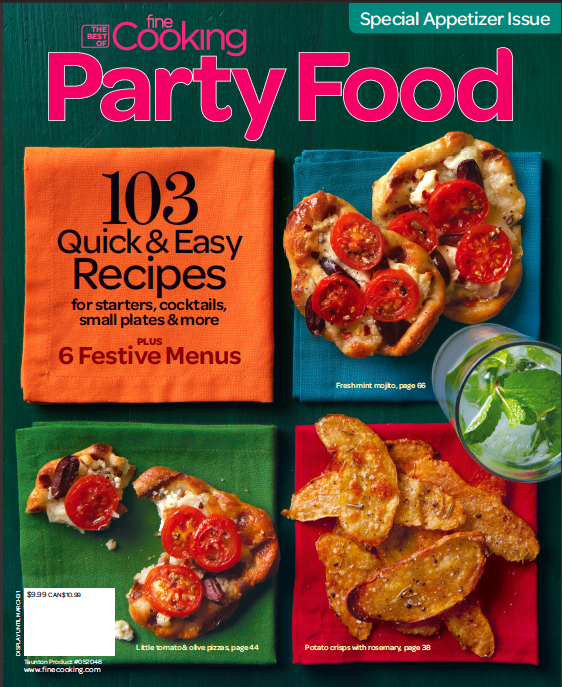 Extra Covers: Consumer Centric or Advertising Centric? From the good, the bad and the ugly department, this week witnessed the arrival of three magazines with “an extra cover.” Same magazine, two covers that are not split covers, but rather one cover on top of the other (if there is such a thing as a second cover since it is already covered). One of those covers was, believe or not, nothing but an advertisement. Yes you read that right. 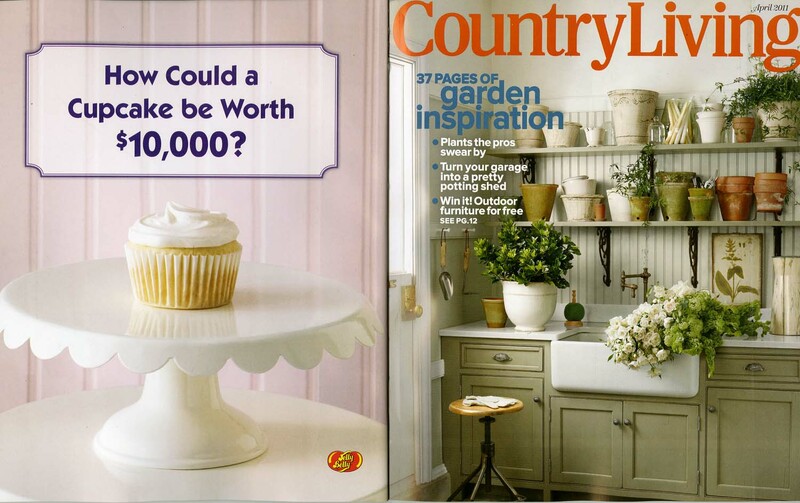 An ad with the complete magazine logo, UPC and cover price. 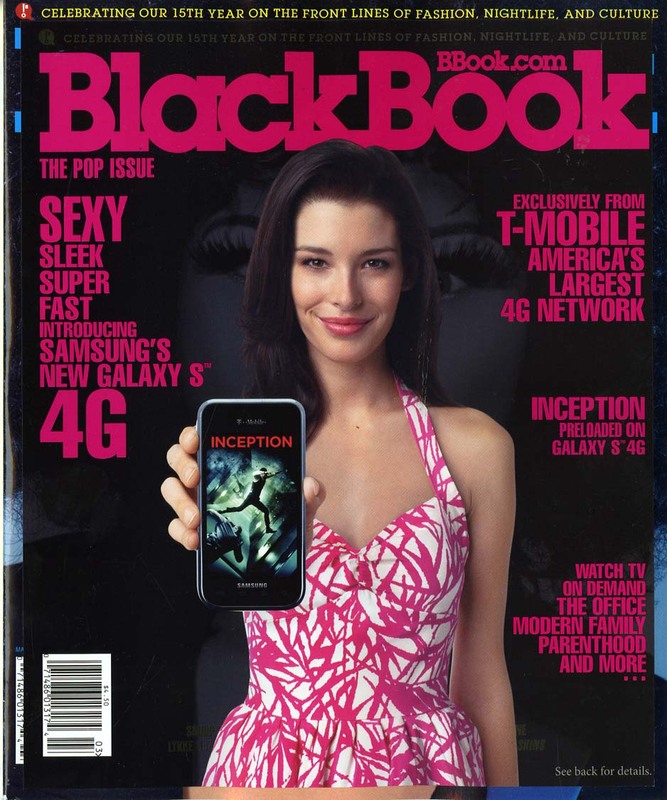 The folks at BlackBook magazine seems to have gone out of their way to provide T-Mobile with a platform like no other. Never mind the confusion on the newsstands and the problem with having two covers that carry the UPC imprint (the computer coded universal price code) on both covers. In stores that depend on stripping and returning the covers only for credit, which one of the two will they send? Also, of course is this practice acceptable for a consumer magazine sold on the newsstands? Judge for yourself and take a look at BlackBook covers below. 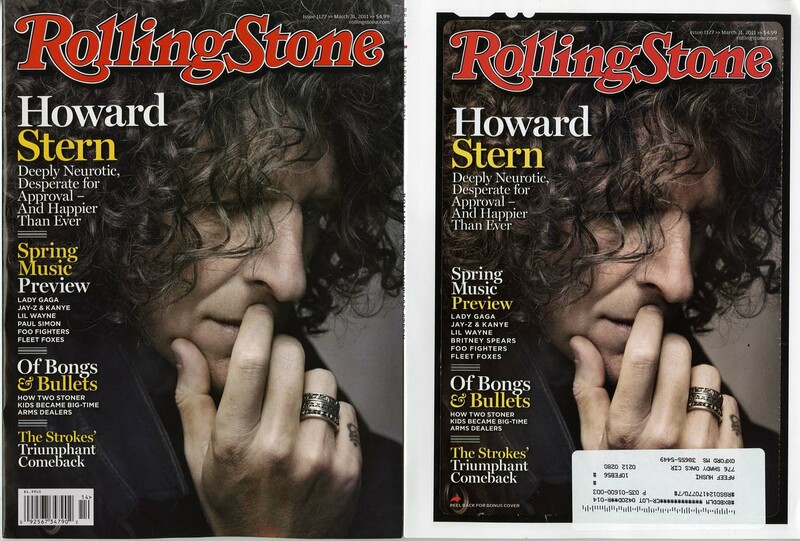 RollingStone magazine also had a double cover this issue. The newsstands distributed magazine had one cover before the other and the subscription edition had a very creative (which is the second time RS does something like this) embedded second cover within the first one. Subscribers have to peel the cover off the second cover. The end result is the same, more fun for the readers and more space for advertising. Now we have two front back cover-ads instead of one. Subscribers were directed to peel the cover to see the other one, single copy buyers were told nothing. They just had to open the page! See both covers below. 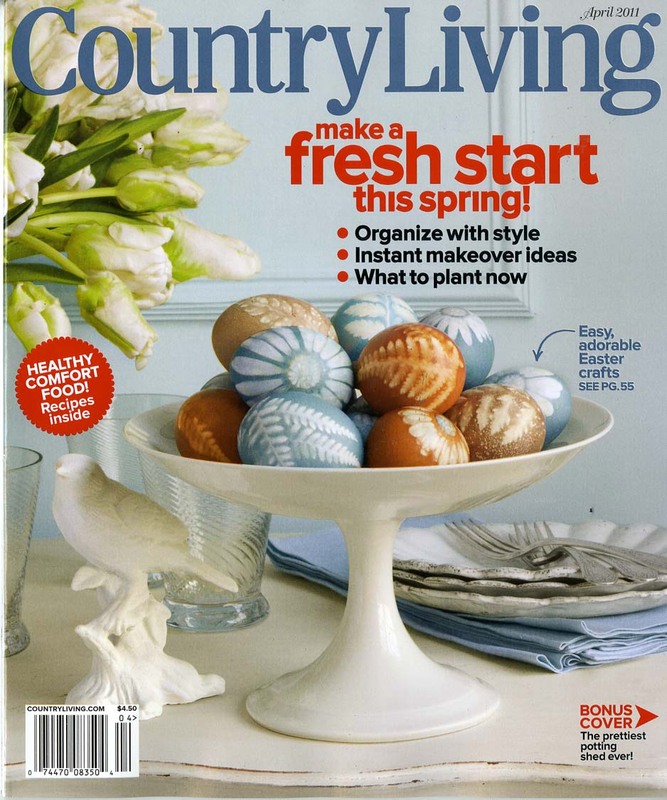 Last, but not least, is Country Living promising its readers on the front page with a bonus cover inside. The covers are editorially different, but they share the same DNA of the magazine. However, it is obvious that the “two for one” covers were created to create space to a well coordinated ad campaign for Jelly Belly. The first “back cover one ad” is a question with a little Jelly Belly logo (see below) and then when you flip cover two you see the rest of the ad (You have to buy the magazine to get the rest of the ad… I limit my examples to covers and not ads)… Take a look and judge for yourself. Who says the magazine business is not a fun business! Enjoy. 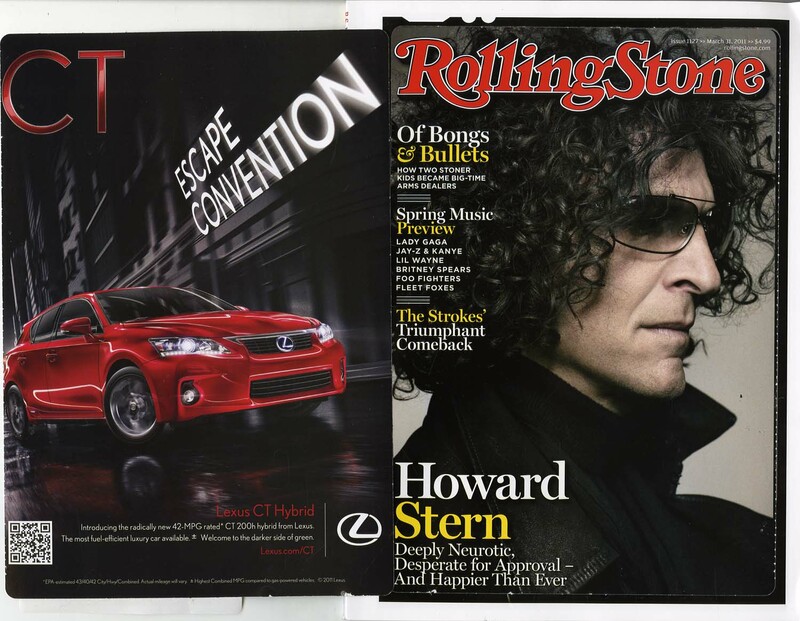 When I started the Magazine Innovation Center more than one year ago, my goal was to help amplify the future of print. 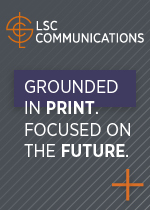 The goal, was, is and will continue to be, to use digital and the new technologies to help amplify print and its future. Last month I had the opportunity to visit one such company that is practicing what I am preaching: they are using technology to amplify the future of print. HP, through its MagCloud operation provides a service that offers publishers a complete publishing cycle. From uploading magazine pages, to printing, distributing and banking, MagCloud opens the opportunity to any one with an idea for a new magazine to use its services to make dreams come true. While print on demand and MagCloud is still in its infancy compared to the traditional printing model, I saw a lot of hope and a lot of possibilities for the future and power of the printed word. Some major magazine editors such as Jackie Leo, the former editor in chief of Reader’s Digest magazine used MagCloud to publish her first print issue of The Fiscal Times and the same is true for LiveStrong magazine published by Lance Armstrong and his LiveStrong organization. So what gives? For us it’s never been a matter of print or digital it’s been about choice. We aim to be a one-stop shop for content publishers so they can focus all of their attention on their content and their customers. We see MagCloud as much more than print-on-demand service; it’s a content publishing platform. I think at some point nearly all magazines will be printed on demand. 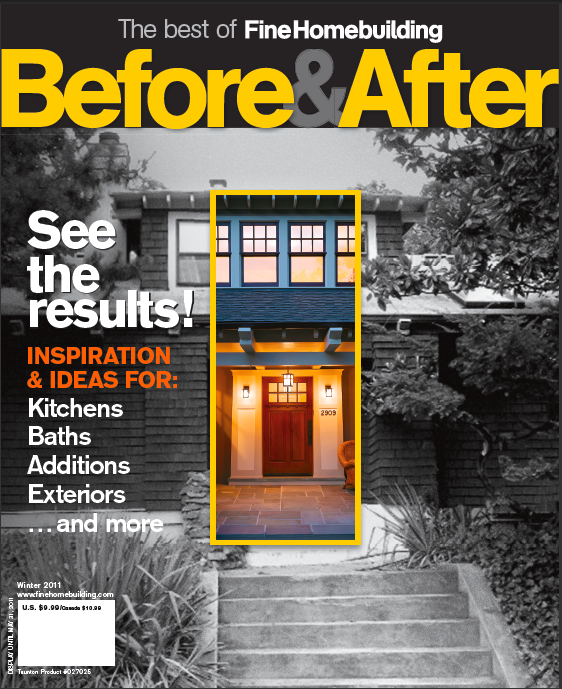 The beauty of digital printing is you can offer the same professional quality consumers expect from traditional magazines without the overhead of large print runs and long lead times. Samir Husni: When a normal consumer thinks about HP, their brains don’t jump directly to ink on paper. So why is HP interested in something like MagCloud? Andrew Bolwell: HP has been a leader in both consumer and commercial printing for a long time. If you think of the number of HP digital presses used in the publishing industry we’ve been putting ink on paper for quite some time now. We’ve also been focusing a lot of attention on the cloud with web services and back end infrastructure. MagCloud really sits at the cross roads of those efforts, marrying our expertise in print and cloud services, so is a natural extension of what HP does well. SH: How much do you believe in the future of ink on paper printed products? AB: For us it’s never been a matter of print or digital it’s been about choice. You can’t deny the beauty and wonderful tactile nature of print. 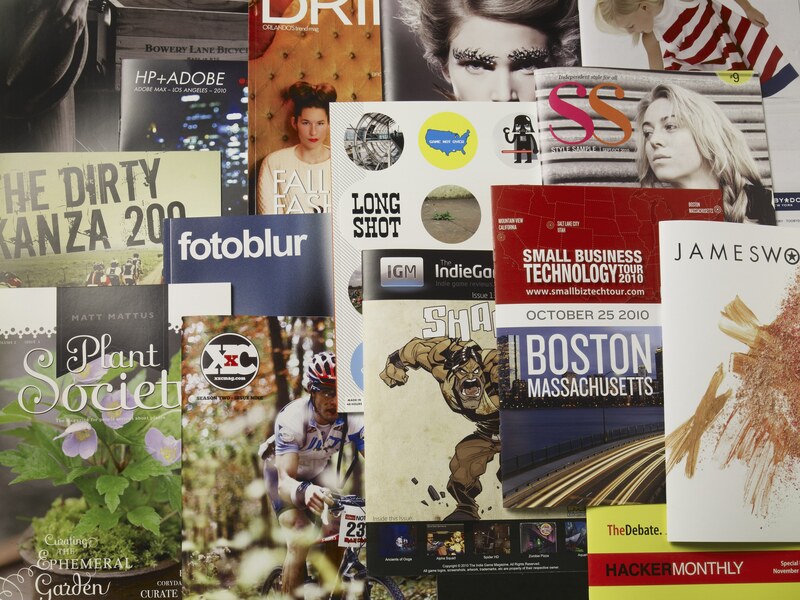 People buy magazines in print every day and we don’t see that going away anytime soon. We also think if you can take that beauty and permanence of print, and marry it with technologies that allow printed content to be highly customized, then you can start to imagine some pretty interesting new print products and advertising models. But back to my point on choice, we also appreciate the convenience of digital and that’s why we’ve been expanding to offer a digital option to our publishers and readers as well. SH: Digital printing and print on demand is gaining ground around the globe, how does MagCloud set itself aside from other print on demand companies? AB: We see MagCloud as much more than print-on-demand service; it’s a content publishing platform. What our customers appreciate is that they can simply upload their content to MagCloud and make it available in a variety of formats—print and digital—at whatever price point they want, with MagCloud managing all of the heavy lifting and providing the publisher with royalty payments. So order taking, printing, distribution etc. With MagCloud, publishers can now focus all their attention on content creation and marketing their products, because we handle all the other aspects of production and distribution that in the past have made publishing a relatively expensive and risky endeavor. SH: What do you see as the future of print on demand? AB: Very bright. I think at some point nearly all magazines will be printed on demand. SH: What are the goals of MagCloud? AB: We want to transform the publishing industry, and create a model where anyone can easily publish content and distribute it as print and digital products worldwide. All as easy as uploading a video to YouTube. We also want to remove the barriers and mystique of traditional publishing in order to proliferate the creation and distribution of highly customized, targeted content. People publishing their passion. And we want people to have access to a much broader and diverse range of highly targeted magazines than is available using traditional publishing models today. SH: Entrepreneurs seem to be a natural fit for the advantages of MagCloud, but how can an established magazine or media company benefit from MagCloud? AB: It’s a good question. MagCloud is enabling existing media companies to be more experimental allowing them to adopt that same entrepreneurial spirit. With MagCloud established magazines can create customized and versioned issues based on audience, location or special interests, repackage existing content archives or test market new titles. SH: What is the MagCloud model and how does one publish through MagCloud? AB: MagCloud is as simple as uploading a PDF. A publisher uploads a PDF of their publication to the MagCloud website, selects their binding type and sets a price for both print and digital versions. The MagCloud service takes it from there with order and print management, as well as global distribution. We then pay publishers monthly based on sales. SH: MagCloud seems to work as a pre-press, a printer, a distributor and a banker, can you elaborate on how exactly the role of MagCloud is defined? AB: Yes, we aim to be a one-stop shop for content publishers so they can focus all of their attention on their content and their customers. MagCloud’s role is as content service provider; we provide publishers a self-service content publishing platform that takes their magazine from PDF to print and digital consumption. SH: In a few words, what is vision and future of MagCloud? AB: In a few words? A content service that enables a world of publishers to easily make their content available to a world of readers, in both print and digital formats. We want to be the service that enables that. And looking forward, we want to evolve the MagCloud platform with additional services, such as content targeting and advertising, that will offer publishers new ways to make their content profitable and allow it to be consumed in new and compelling ways. SH: Can you tell me about some of the pleasant surprises and biggest disappointments Magcloud faced in its first two years? AB: One of the greatest surprises has been the diversity and creativity of the publications that are published through MagCloud. We have magazines on almost any topic, created by publishers of all ages all over the world, and have seen publishers collaborate using only the web to create magazines that until now were just not possible. It’s been truly exciting to see the breadth of content that MagCloud has unlocked. And for those of you who are still reading, what are you waiting for? Go get your magazine ready, upload it and join the wonderful world of print: one magazine at a time. Enjoy! A cover with more “strength and calm” for Men’s Health! Wow! That was my reaction when the April’s copy of Men’s Health magazine arrived in my mailbox. A complete departure from their traditional cover design and colors. 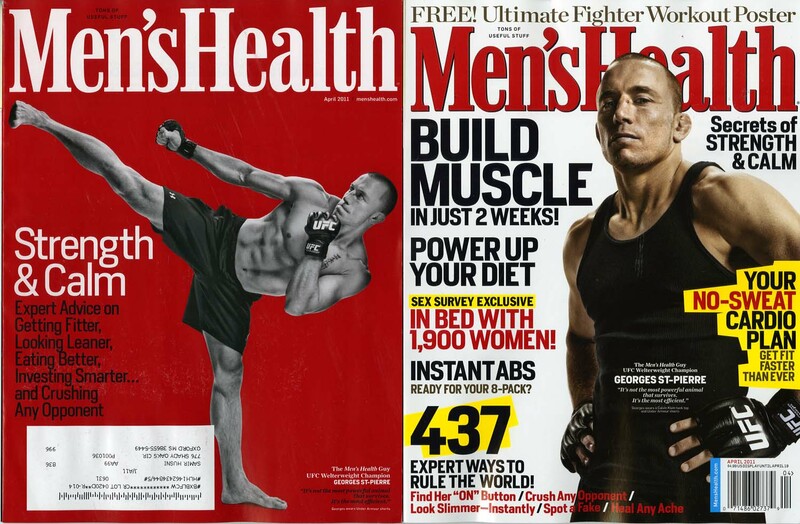 Men’s Health has been a leader in creating subscribers’ covers that differed from the single copy ones (usually with reduced type size and fewer cover lines), but the April issue subscription edition is new to me and the rest of the magazine subscribers. Who says you need technology to create innovation in print! Covers that make readers take a second look are an innovation by themselves. Once you take a second look, you are engaged and the magazine is already in your hands. Enjoy! This is a story of a family business, a very successful family business. Taunton Press, publisher of everything “Fine” was founded more than 35 years ago. Its corner stones: consumers; its publishing model: consumer centric. The end result is one “Fine” magazine after another. Fine Woodworking, Fine Cooking, Fine Gardening… you get the picture. I had the opportunity to talk with one “Fine” member of Taunton Press, Sue Roman, the president of the company and daughter of the founders Paul and Janice Roman. After my initial questions about the company and its role in today’s market place, I found myself going back for more. I discovered that there was as good a story about Sue Roman as the one about the company she leads. Sue was gracious enough to answer my “company” questions and then sits for a second round of questions, but this time about her story, her dreams and how she ended up on the helm of such a very successful magazine company. In our magazines, the reader is at the center. We ask them for a hefty subscription price, and then work really hard to deliver that high value in the magazine. We strive to serve all the information needs of our customers. All advertising is endemic to the subject of the magazine for all of our magazines. We honor both the reader and the advertiser. Readers know to look for the advertisements in the front and the back of the book; however when they are in the article well they will find no advertisements to distract them from the content at hand. Our editorial/art teams are masterful with using the magazine format to take complex ideas and processes and make them accessible and engaging. If the publisher doesn’t think the magazine is valuable, as signaled by the subscription price, the reader won’t think it is valuable either. When you’re focusing on communities of people who are passionate and who will talk to you and who like what you’re doing, you just kind of keep wanting to do more and figuring out what you can do. 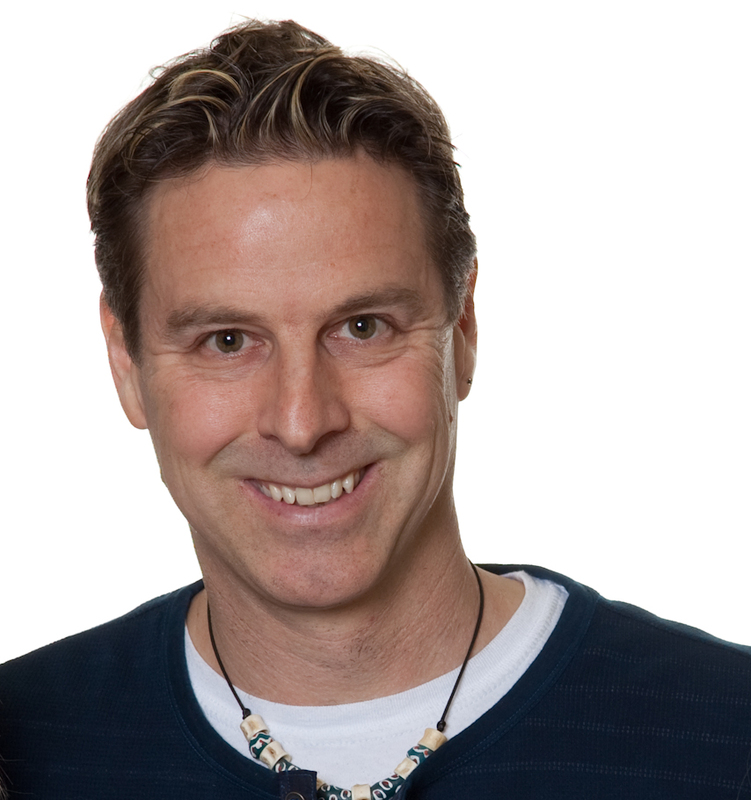 I thrive on the challenge of what’s new and what’s going to resonate with people today. I think one of the best skills you could ever have is being a good writer, a good thinker and a good interviewer. If you can do those three things, you can go far in any kind of publishing. Where I see the difficulty is in the already-existing businesses that have already trained their readers to not value their product, to not pay for the product. Samir Husni: Let us start from the beginning, the foundation of Taunton Press. Take us through this consumer centric family business. 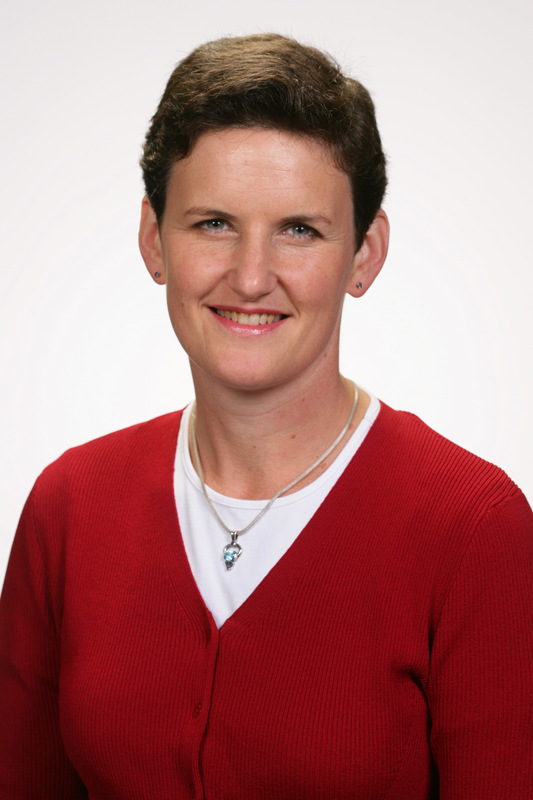 Sue Roman: Much of the foundation of how we operate was established at the beginning. My father, Paul Roman, started Fine Woodworking magazine, and hence the company, in 1975 to serve people just like him. He was a hobbyist woodworker and wanted to make beautiful things out of wood, but couldn’t find good information. He talked to the best woodworkers in the country at the time and asked them if they would be willing to share their expertise. Several key woodworkers said yes and he knew he could make the magazine. Next he and my mother, Janice Roman, his business partner, had to find out if enough people wanted the magazine. They created a direct mail piece that instructed people to send $8.00 for a quarterly magazine to a post office box in Connecticut. The response was very high (15%), so they cashed those checks, used that money to send out more direct mail, and with the first issue they had 25,000 subscribers and a sustainable business. I’m including a scan of the first direct mail piece and an article written about the launch for Fine Woodworking’s 25th anniversary. From the beginning, advertising has been a service to the reader to help them find the tools and materials they needed to practice woodworking. All advertising is endemic to the subject of the magazine for all of our magazines. Even though Taunton magazines have a high demographic (the average HHI for our magazine readers is $150,000), the point of the advertising is to serve them as enthusiasts. This creates a win-win for the reader and the advertiser. Readers read the advertisements with great interest and need, and advertisers reach highly qualified, highly active participants. We honor both the reader and the advertiser. Readers know to look for the advertisements in the front and the back of the book; however when they are in the article well they will find no advertisements to distract them from the content at hand. All size advertisers are important to us, as they are to our readers, and you will see fractional ads in prominent places in both the front and the back of the magazine. All of our magazines follow this format. We strive to serve all the information needs of our customers. Not only does Taunton serve them through magazines, but also through websites, books, DVDs, apps, and ebooks. We do fulfillment in house so we can stay close to our customers. 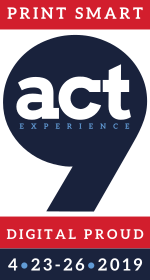 When you call customer service you are speaking to someone in Newtown, CT who can help you with all product needs, or put you in touch with one of our editors if you have a question about the activity itself. We had a guy ankle-deep in wet concrete call Fine Homebuilding with a foundation question. That’s not uncommon at all. We had a gentleman sadly call our customer service to cancel his Fine Woodworking subscription after many years because he had developed an allergy to wood. After letting him unload his disappointment about giving up a hobby he loved, our customer service rep suggested he needed a new hobby, and by the end of the call he had switched his subscription to Fine Cooking. SH: Your were one of the early practitioner of the “consumer centric” magazine publishing model before a host of companies started paying lip-service to the phrase. Can you expand on that consumer centric concept. SR: In our magazines, the reader is at the center. We ask them for a hefty subscription price ($29.95-$37.95 for a one-year subscription depending on the title), and then work really hard to deliver that high value in the magazine in terms of finding the best experts in the field to be authors, producing detailed photos and drawings, and using archival quality paper. The beauty of our model is that by staying close to our readers, and serving them well, we can provide advertisers a highly engaged audience who are hungry for the products and services they offer. The readers are highly qualified because they have spent a good amount of money on the magazine demonstrating that they are willing to spend money on their passion because they are deeply engaged. 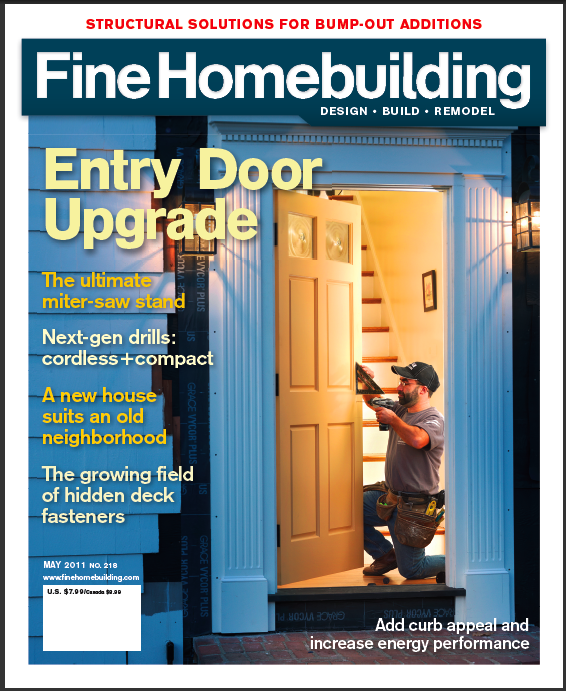 The engagement level our readers have with every one of our magazine is off the charts (for instance, an average of 2.4 hours spent reading each issue of Fine Woodworking; Source: Harvey Research 2010 subscriber study). This means that the ads are in front of our readers multiple times. Since Taunton’s beginnings and even in the most recent surveys, well over 90% of our readers tell us that they keep every back issue for future reference. For convenience we have produced DVD archives of all our issues, which have been big sellers for us. SH: What are the secrets of success in your publishing business model? SR: We look for three things in a magazine. First, will the readers support the magazine? That means will they pay a subscription price and single copy price that is sufficient to profitably produce the magazine. Second, is there a strong base of advertisers who want to specifically reach these people? Third, is the subject matter well served by the format of the magazine? Can it be compellingly communicated on a magazine spread, and is there an ongoing conversation about the topic that will keep the magazine lively for years to come. SH: Do you think that is the reason of your success story on the newsstands? SR: We’re doing very well on the newsstand because readers can see and feel the quality of the magazine when it is in their hands. But there’s another factor–Taunton’s approach is in perfect alignment with the needs of wholesalers and retailers. We have high cover prices ($6.99 – $7.99 for core issues, $6.99 to $12.99 for SIPs) and manage our sell-thrus carefully. Combine that with consumers wanting our magazines, and the result is that wholesalers and retailers can make good money on our distribution without handling tons of copies. And because newsstand sales is a profit center for us, we continue to spend promotional dollars even in the economic downturn. We also treat the wholesalers and distributors as our partners, and send them a monthly electronic newsletter to keep them up to date on the new issues we are bringing out. SH: Lately you have been publishing a host of special interest publications (SIPs). Is this a trend? How do you see the future of SIPs? SR: In the last seven years we have produced a number of SIPs. Using our excellent newsstand distribution, we publish issues around particular topics that complement our regular issues. We work hard to make these highly valuable products, and the cover price matches that value. Because we produce some of the most in-depth, authentic information on the interests we publish in to satisfy our core hobbyists, SIPs with their single-topic orientation represent “the last and best word” for many folks who are not full-out enthusiasts. Introducing them to Taunton in this way helps us garner direct sales of other products while they are focused on their projects. SH: Although you are consumer centric, yet your magazines include advertising. What role advertising play in your publishing business model? 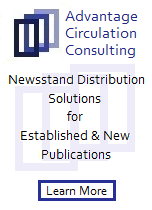 SR: While the biggest proportion of our revenue comes from the reader in subscription sales, direct ancillary product sales, newsstand, and trade sales of our nearly 1,500 products, the advertising revenue is very important to us from the standpoint of overall profitability. Part of our mission is to connect enthusiasts with the suppliers of the tools and materials they need to be successful in their activities. We can do this in a number of ways including in the magazine, on our website, and in apps. Our leads are highly qualified because they have demonstrated their commitment with the money they spent to purchase our magazine and with the time they spend reading it. Taunton is an integral part of the markets we are in, and we want the tools, materials, and supply makers and distributors to be as successful as possible. We will work with them in creative ways to get in front of the people who want their products and services. SH: If you take a look into the crystal ball, how do you see the future of printed magazines and what are you doing to amplify it? SR: If you study our magazines, you will see how well served the information is by the magazine format. We can combine technical drawings, how-to photos, and deeply informative and engaging text all on the same spread. Our editorial/art teams are masterful with using the magazine format to take complex ideas and processes and make them accessible and engaging. Readers recognize this when they hold one of our magazines in their hands, and are willing to pay a high newsstand price or subscription price for it. This bodes well to me for the future of our type of printed magazine. Our readers refer to back issues many times. We have used digital editions as a handy reference for them to search through past issues. We have been selling digital archives in CD or DVD format for nine years. Digital editions are also highly valuable to our international readers because they can get them on the publication date and not wait weeks for their issue to arrive in the mail. Digital issues are also a good way for people to have access to the magazine wherever they are. And there are many other ways to serve enthusiasts both in print and digital formats. Taunton has a robust book program with more than 40 new titles per year and a backlist of more than 500 books available. Our fastest growing area has been online–Taunton’s Home and Garden Network is now number 15 in Comscore’s home category for web visits. We can connect and serve enthusiasts on our websites in ways that complement and support our magazines. Our magazine editors are completely plugged into our web activities. Video is a very compelling medium for how-to information, and we produce a lot of it for our sites. Our online audience is also highly engaged and makes the commitment to pay a fair price for content. We have over 80,000 paid members to our websites. SH: If someone comes to you and say, “Sue, I would like to start a new magazine,” what would you tell that person? SR: When people ask me for advice, I tell them to charge a subscription price that truly reflects the value of the magazine. If the publisher doesn’t think the magazine is valuable, as signaled by the subscription price, the reader won’t think it is valuable either. This also frees you from ups and downs of advertising for the success of the magazine. In good times and in bad times, people have a fundamental need to create things with their own hands. People like to control their corner of the world, and make things to share with family and friends. We saw more people realize this after 9/11, and sales of our magazines, especially on the newsstand, reflected this. The economic crash in 2008 definitely hurt foot traffic in stores, decreased the money advertisers had to spend, and hurt the housing industry overall, and we felt all those things. However the underlying business model proved to be sound. With a balanced revenue portfolio between subscriptions, newsstand, and advertising, and with a rapidly growing digital/online business, we were able to cope and adjust to the new economic circumstances. SH: How do you view the future of Taunton Press five years from today? SR: Five years from now, Taunton will be fulfilling its mission of connecting enthusiasts with compelling and trusted information, services and products that help them fulfill their aspirations. We’re counting on print still being a viable format, but we are also preparing for more digital delivery through apps, mobile, web, and formats yet to be invented. Basically, our premise doesn’t change because enthusiasts will always want relevant, in-depth information and celebration of their passion. However, we are excited about the increased numbers of tools we have in digital media to address these passions and the ability to serve the reader anytime, anyplace, and in whatever form they want. SH: One of the fascinating things is that Taunton Press is a family business. How did your parents drag you into this business? SR: When my parents launched this, I was just getting into my teenage years. I was very much aware of what was going on. It was a very fast-growing business. They would come home from work and talk about what they were doing over the dinner table every night. They were wrestling with, “How do we grow this company? What’s next?” It permeated the house with all their business discussions. At one point we told them that they couldn’t talk business at the dinner table anymore. I worked here every summer through high school, through college. They were always short-handed and growing fast, and there were lots of opportunities. So, each summer they would throw me into a different area and say, “Go help out this person,” or “Go figure that out.” It was great training. 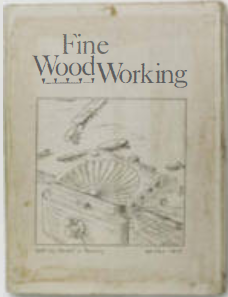 I did everything from typing in subscription orders, developing photos in the darkroom; one summer I drew the charts for one of our first woodworking books. I programmed computers. In 1984, my father said, “Well I don’t really have a good sense of how all the different parts of this business work together, will you collect all the data?” I spend all summer collecting data on all the different parts of the company; talking to different people and I put together this huge report for him, which I labeled at the time, “The Hitchhikers’ Guide to the Taunton Press.” It was just a wonderful way to grow up. When we started video, I got a call when I was in college and got asked if I wanted to go out to California and be the grip on a photo shoot. I said, “Of course,” and I spent a week in a photo shoot with the brass wood-turners in the country. I always had a very good feel of what it was all about growing up. But when I graduated college, I couldn’t get far enough away from here. I actually went off in a different direction. I was very interested in cultural studies. I studied African history, I did a semester in Nepal and after college I moved to Mexico. I thought I was going to be an anthropologist or do something with cross-cultural interaction. Then I got interested in bilingual publishing. I decided before I go start my own bilingual publishing company, maybe I should make sure I know what I need to know. My parents had always told us they didn’t want us to come back here and work after college. That wasn’t a problem; nobody wanted to. Then five, seven, eight years later, my parents were telling us, “Any of you want to come back and work here?” I said I would come back for a couple years and learn the ropes because I really wanted to start a bilingual publishing company. So, I moved back from Mexico and they plugged me into a marketing job and then a year later, Fine Cooking was an idea that we started working on. I told my father I really wanted to get on the editorial side. Then I became an assistant editor. I completed 19 years here the other day. I guess I never got around to doing that bilingual publication. It’s just been a fascinating place to work. It’s been constantly evolving, constantly changing. I gravitated to the editorial side and new product development. I spend a lot of my time here in new products. When the web was young I spent a couple years trying to figure out what that was going to do for us and leading our new media group. When you’re focusing on communities of people who are passionate and who will talk to you and who like what you’re doing, you just kind of keep wanting to do more and figuring out what you can do. There are so many different ways of doing that. Magazines are great and they’ve gotten a lot more interesting over the years with all the new tools. And there are books, web, video, digital, mobile and apps, and I just find it really fun and exciting. SH: The entire environment for the Taunton Press was consumer-centric even before that term existed. A lot of people are paying lip-service to the term “consumer-centric,” but you’ve been practicing it and you continue to practice it. Did that make an impact on your decision? SR: People here are very close to what they’re doing. One of the ways we recruit Fine Woodworking editors is we show them our workshop. And we tell them,”Well, you can do your own projects there on nights and weekends.” You’re surrounded by people who are the audience; they are cooks, they are woodworkers, they are sewers. There’s no gap between us and who we’re writing for. You just get that feeling that we are really a part of all of our communities that we’re in. We have people here who are on the high-passion end and they really get our readers. Most of our editors were readers before they came here. It flows very authentically. SH: Do you see more magazines going in the direction of your business model, or it is impossible to do at this point? Can the Taunton Press business model be replicated in today’s marketplace? SR: Definitely. I’m part of the independent magazine group at the MPA and there are many more companies like us now. I think you can start a business like this. Where I see the difficulty is in the already-existing businesses that have already trained their readers to not value their product, to not pay for the product, to wait for a subscription notice to tell them their product gets cheaper and cheaper the longer you dawdle on your renewal. The companies that have already trained their customers to think a certain way; I think it’s going to be tough for them to make this switch. Also, it goes back to the DNA of the company. Where is the power and authority within the company and is it balanced or is it in the hands of the advertising? And if it is, that’s a hard shift for a company to make if you launch that way and you’ve been that way, then getting into these new distribution streams or into new gadgets and delivery mechanisms, they’re just more of a new twist on what you’ve already been doing. With our business model, we can add on more of an ad based product, we can add on a completely user paid product, a continuity thing, like a subscription, we can add more of a one-off product, like our book sales. Or we can do something that is very blended, which is how online is for us. We’ve got a whole mix of businesses online and they can all play together. SH: What makes you tick? What makes you say, “Wow, I love my life,” or “God, here’s another day.” Give me the reason you get out of bed in the morning. SR: I thrive on the challenge of what’s new and what’s going to resonate with people today. It may or may not resonate with them yesterday, but what’s going to resonate with them today, what’s going to resonate with them tomorrow and how can we figure out how to make that. I love making things. SH: What advice do you give to journalism students? Should they just give up and go major in something like anthropology? Do they have a future in journalism? SR: I think one of the best skills you could ever have is being a good writer, a good thinker and a good interviewer. If you can do those three things, you can go far in any kind of publishing, and also having a lot of flexibility. I didn’t get into what our editors do here, but our editors travel out to the woodworkers, to their woodshops; they interview them, they have dinner with them, they help them write their stories, they take photographs, they might take video, they might blog about their trip. Being open to the interesting things going on in the world and being able to distill them in ways that other people can understand, which I think is what journalism is all about, is a great skill. There are more outlets for that now than there have ever been, so I think it’s an even more desired bundle of skills. Amazing news comes via John Harrington’s The New Single Copy regarding the total number of titles that were distributed on the American newsstands last year: 10,000. John cites MagNet as the source and writes: “MagNet found that more than 10,000 BIPAD numbers, each representing a different title, were reported as having some sales by its member wholesalers, who account for approximately 99% of all magazine sales.” The 10,000 number of titles is FIVE times that of the number of titles back in 1980. Amazing indeed. Also, more amazing news comes via today’s The Wall Street Journal Felix Dennis buys Mental Floss magazine. A smart move from a man who knows a good thing when he sees one. Congratulations are in order for both the buyer and sellers. The two founders Will Pearson and Mangesh Hattikudur will continue with the magazine that aims to make you feel smarter. What a great way to start your Monday morning… Enjoy. 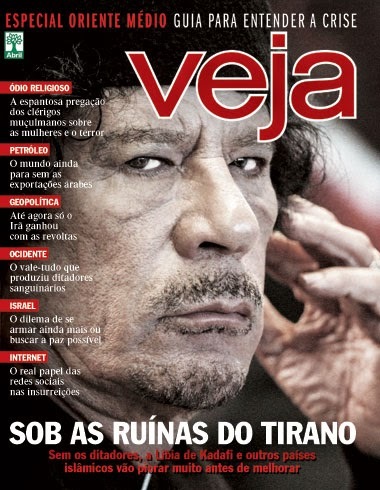 From the many pictures that came out of Libya, one image of the Libyan leader Qaddafi found its way to two magazine covers: The Economist and The Weekly Standard. The Economist used a touch of “blood and oil” colors to accent the picture and The Weekly Standard opted for the straight shot. Which magazine do you think did the better job with the picture? It is amazing when you think that there were probably thousands of pictures to pick from, and two magazines on both sides of the Atlantic chose the same picture. I guess great pictures still dictate the great editors’ choices. Judge for yourself. 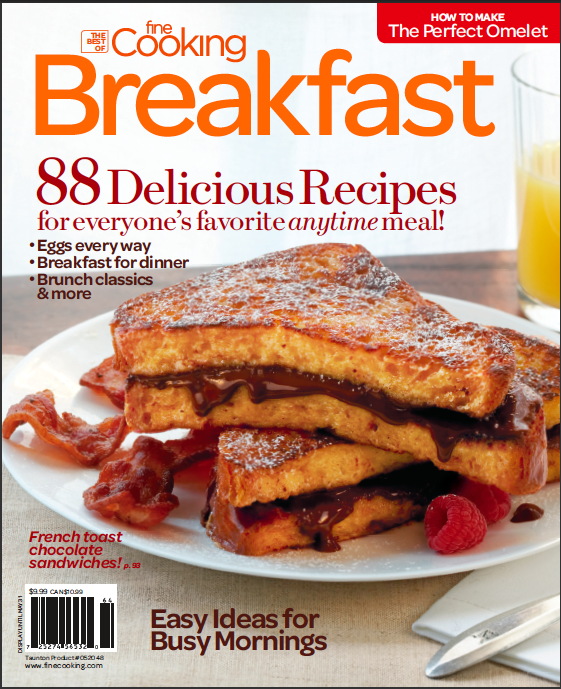 You are currently browsing the Mr. Magazine blog archives for March, 2011.